I’ve always believed that humans are products of their environment. We all grow up differently and have different experiences that shape us, whether it’s how we eat, what we value, or what our interests might be. And because of this, if you spend time with others, you ultimately play some role in how they behave. Now, obviously, this works in varying degrees. Your influence on your children, grandchildren, husband, wife, partner, or best friend is far greater than the influence you have over your neighbor, doctor, or co-worker—or at least to a different degree. But you influence how the people closest to you feel about themselves, how they treat others—and even what they eat. I believe that some conditions, although widely considered hereditary, are not. I believe they are reflections of the way a person was raised and what they considered normal. For example, in many cases, but not all, a person’s weight is largely determined by what they eat. If you grew up in a home that regularly ate fatty, sugary, processed meals, and your family members generally stayed away from exercise, it’s likely they are overweight and at high risk for conditions like type 2 diabetes, heart disease, and certain cancers. And because the eating habits you form when you’re young can stick with you throughout your life, this cycle can continue quite easily—meaning you could also be putting yourself at risk for type 2 diabetes, heart disease, and cancer. This is especially true if sitting down for a family meal is rare in your house. But even if you allow your young ones and loved ones more independence when it comes to deciding when and what to eat, it doesn’t mean they will make the right choices. In fact, a recent study showed teens who don’t regularly eat with their families are at much greater risk of becoming overweight or obese. The study, published in The Journal of Pediatrics, tracked 2,287 girls and boys in their teenage years and did a follow-up 10 years later. At this follow-up, 51% were overweight and 22% were obese. After controlling for a number of factors, researchers found that those who generally never ate meals with their families were twice as likely to be overweight as those who regularly ate meals with their families three or four times per week. Even one or two meals reduced a participant’s risk of obesity by 33%. Walk by any McDonald’s and you’ll see where teens are eating when they’re not at home. The researchers admit that asking people to recall how many meals they ate at home isn’t the best way to track habits for a scientific study, but it does offer some insight into the effect of overall eating habits. One reason I see obesity numbers going up is that teens can only afford cheap, processed food—for the most part. Also, if they don’t feel they can eat with their families, they might be battling depression, something that’s been proven to influence eating habits. At the end of the day, it’s important to realize that you’re not just responsible for yourself. The choices others have made before you impact how you live, and your choices impact others. If you want, or need, to make changes to break away from past habits and improve your life and the lives of others, do it. You could be saving more lives than just your own—and all it could take is simply making some family times for meals. 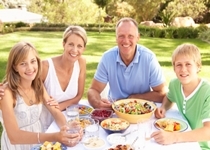 Berge, J.M., et al., “The Protective Role of Family Meals for Youth Obesity: A 10-Year Longitudinal Association,” The Journal of Pediatrics web site, September 29, 2014; http://www.jpeds.com/article/S0022-3476(14)00777-X/fulltext. Universite de Montreal, “Vicious cycle of over-eating and feeling depressed explained,” ScienceDaily web site, May 23, 2012; http://www.sciencedaily.com/releases/2012/05/120523101929.htm, last accessed October 16, 2014.